Gokulashtami is just around the corner and many of us would be busy preparing various kind of sweets and snacks for the festival.Though we do not celebrate the festival in a grand manner,we do a regular pooja with neivedyam on this festival.While the general sweet/snack varieties include deep fried savories like palakayalu(seedai),murukku,ladoos,milk based kheers and poha based food; this year for a change I made healthy and low calorie recipes for bakshanam(I know this sounds weird to offer diet food to good).One among them is this oats and dry fruits ladoo which is very healthy and this version is also sugar free and fat free. TH loves to eat dry fruits and it has become a ritual for me to send a pack of dry fruits to his office daily for his evening or mid morning snack.YES,before you even raise your eyebrows let me tell you...I do send snack boxes to him on a daily basis but only fruits and healthy low cal kind of snacks.Though I always try to experiment various low calorie snacks for his snack boxes, those recipes never made their way to my blog.Let me reserve this topic for a later date. 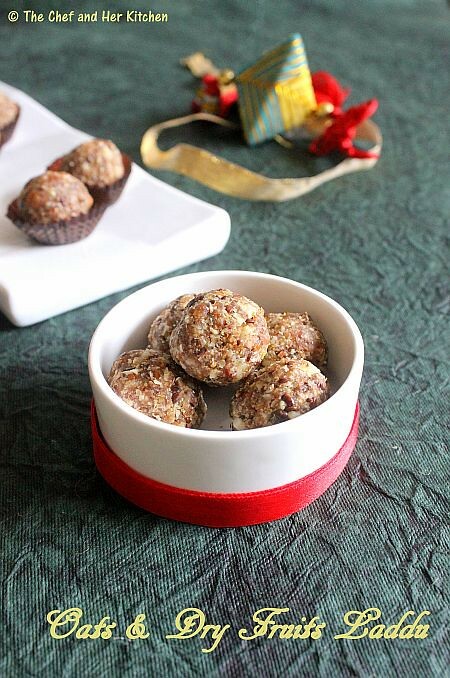 Coming back to today's post, I have used a lot of dry fruits like dates,figs, which impart their natural sweetness to this ladoo.I have also used lots of nuts and flax seeds which makes it quite chewy and nutty in texture.This is a very healthy sweet/snack item which you can eat with a guilt-free conscience-try it out for your loved ones if they are fussy eaters of dry fruits.I chose healthy dry fruits in the recipe and it is your choice to use the kind of dry fruits you want and make variations to this version. I also got inspired by seeing lots of versions posted in various blogs and came up with my own version of ingredients. Dry roast flax seeds until they start popping up and pulse them in mixer for few seconds.Do not powder them completely,just grind coarsely as they give nice nutty texture to ladoo.Remove and keep it aside. Warm almonds,pistachios and walnuts separately one by one and also pulse them separately to get tiny bits.Do this in whipper mode and also do this process separately.Remove and keep it aside. Chop figs and dates finely and run this in mixer for a minute or two.The idea here is to get a sticky but slight coarse mixture as this is the main sweet base and also the binding agent. Now in a wide bowl add the ground dates-fig mixture,powdered oats,almonds-pistachios-walnuts mixture and crushed flax seeds. Mix them well and check for the sweetness of the mixture.If you feel that the sweet is less you can either add more ground dates or figs mixture or you can add a couple of tbsp of sugar powder to the mixture.Mine were perfect for me,this step is left to your choice and also depends on the sweetness you need. 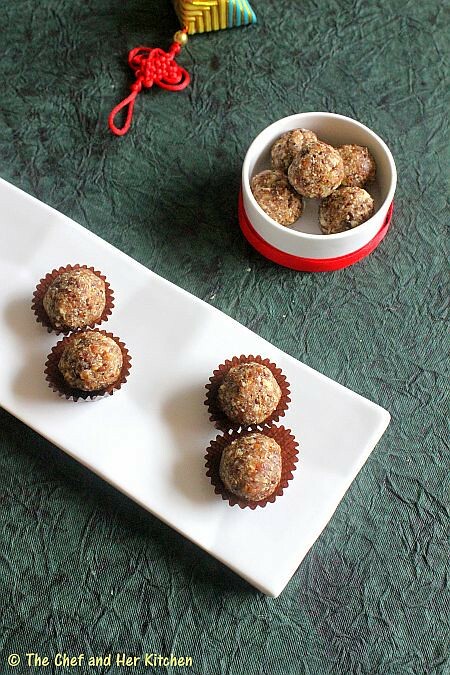 Also try making a small balls of goose berry sized out of the mixture,if you are able to do then it is fine you can proceed and make ladoos.If you cannot roll them into ladoos then add 1-2 tsp of hot ghee to the mixture and try making ladoos. Store them in an air tight container.Stays good for long. 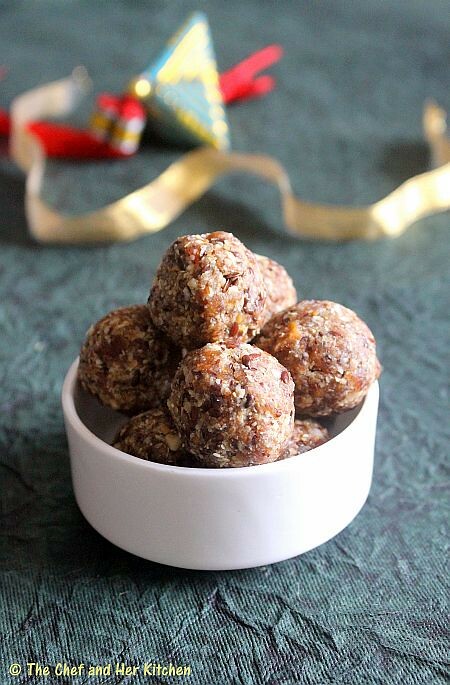 You can add dry fruits like raisins,apricots,cashew nuts and would not be much of a difference in taste.I avoided raisins and cashew nuts in the recipe intentionally as I wanted a healthy option. You can also add 2 tbsp of roasted sesame seeds or khus-khus or roasted and ground peanuts in the recipe for a change.In that case you need to adjust the sweetness by adding extra sugar if needed. This recipe is completely trial and error and also depends on your requirements and taste,so add sugar,ghee,amount and varieties of dry fruits according to your wish. Perfect guilt free snack...Loved the use of oats in it..Tones of goodness..Beautiful clicks.. I do like the idea of offering this to Krishna on His Birthday! I admire the patience with which you have described the procedure with variations. Healthy & yummy.. Beautiful clicks too.. I too make this often...my fav too. Looks tempting!! Wow..such and healthy snack recipe...liked the addition of oats...looks yumm. Such a power packed laddoos, lovely presentation. 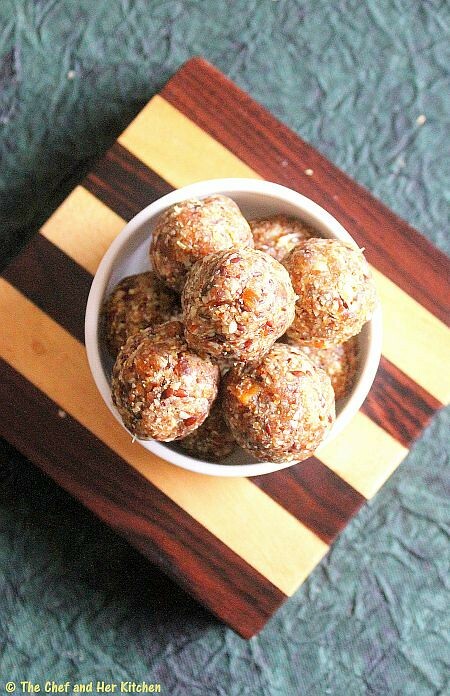 Healthy Krishnastami laddu, I make it the same way, don't add figs (just because I am too lazy to find them :-)), Dates are my favorites. 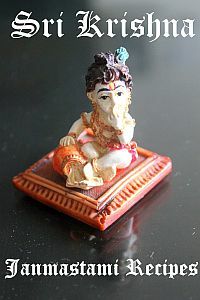 Lovely looking laddus. Happy Krishnashtami to you Prathibha! 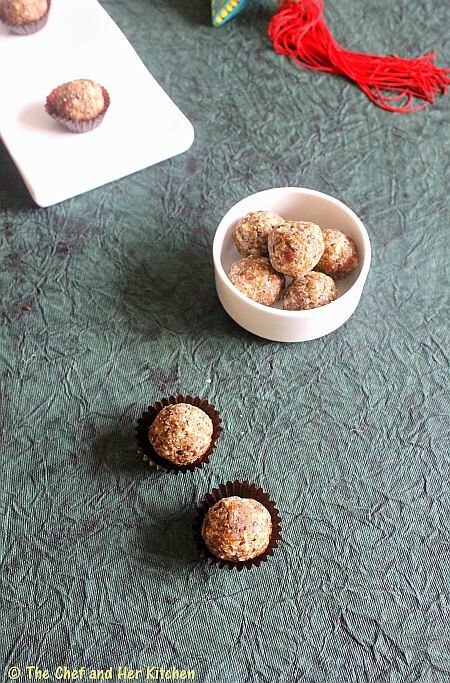 The perfect recipe to make when you do not want all the extra ghee and sugar. The pictures look awesome. 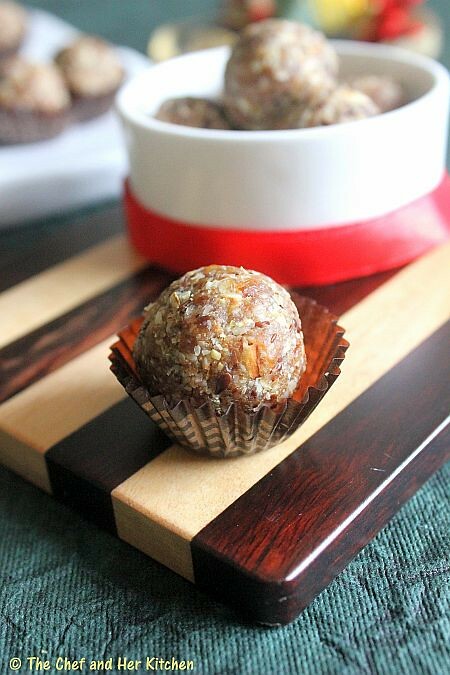 very easy & a healthy ladoo. I used to bring snack box wo office with some snacks. 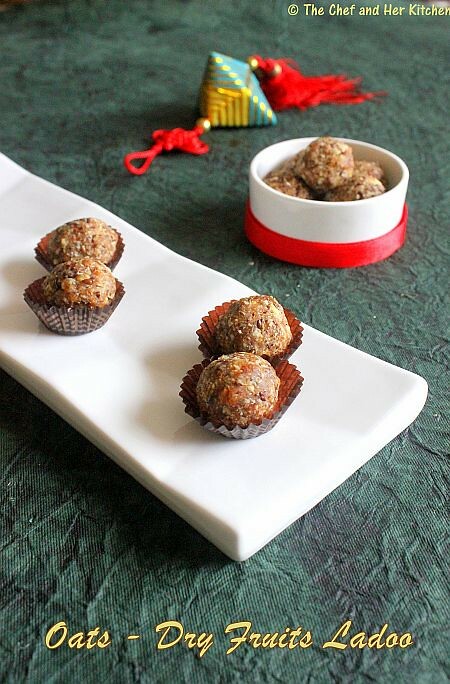 It is an alternate and easy way to prepare healthy laddus and bring to office. Bookmarking to do. OMG such a good blog and healthier too , I read most of your oats recipes , and love the cheats for tiramisu . I am jumping up in joy reading your posts , the good recipes keep rolling . Being a good cook myself I always am looking for healthier options to feed my family good & healthy food .I'm planning to incorporate most of your recipes in my daily cooking. Your wesite is bookmarked . Found you thru one of the Bombat Bhojana member of facebook . You are awesome!!! such lovely healthy ladoos. I am surely going to try this recipe out. Please participate in the diwali event that I am hosting this month by linking your diwali recipes. Thank you.